The suburb of Marmion was named after an early settler Patrick Marmion (1815 – 1856), who operated a whaling station in the area in 1849. 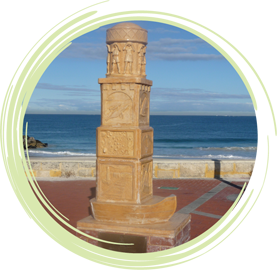 When visiting Sorrento Beach you can view the Odyssey sculpture that marks the site of the Marmion Whaling Station. The site is now home to the Sorrento Beach Surf Life Saving Club and is an excellent example of how beach and coastal use has changed over time. There are other similar sites throughout the Perth metropolitan area, such as the South Fremantle Power Station and the Robb Jetty Abattoir. As an extension to your beachcombing studies, investigate historical beach and coastal use – you may like to create a timeline. Compare our current use of the coastal environment, dating back to traditional Aboriginal use.